Grecian and Roman headdresses are the inspiration of this collection. 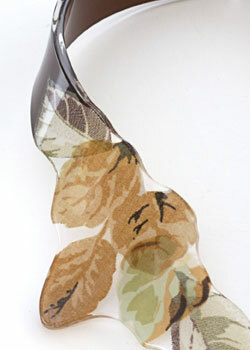 Using vintage fabric the leaves come in a variety of colours and sizes. Each piece made is either a one-off or part of a limited edition. Earrings are unique as neither of the pair match but derive from the same fabric and differ in shape and size and along with leaf brooches compliment the set.